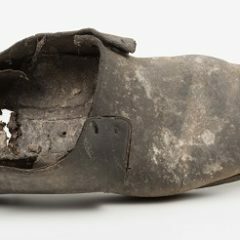 Dr M Faye Prior, Assistant Curator of Costume and Textiles at York Castle Museum, has been busy auditing the museum’s collection of men’s and children’s shoes. 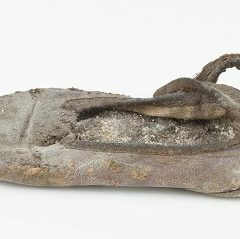 In this blog post, she shares a few of her discoveries: shoes that were used as protection against evil spirits. When renovating old houses, workers often find objects hidden in walls, up chimneys, in roofs and under floors. These range from items of clothing and other personal belongings to bottles and even small animals, and are often in places they couldn’t accidentally have fallen. These objects are known as concealed objects – things which have been deliberately hidden in the belief that they will protect the building and the people inside from evil spirits. People believed that the personal nature of these objects would attract and trap these evil influences. The location of the hiding place was important, too. The objects were left on boundaries (under floorboards, in roofs and between walls for example) as these places were thought to be more vulnerable to supernatural activity. 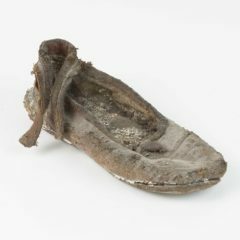 Shoes are one of the most popular concealed objects, with over a thousand concealed shoes discovered throughout Britain alone. 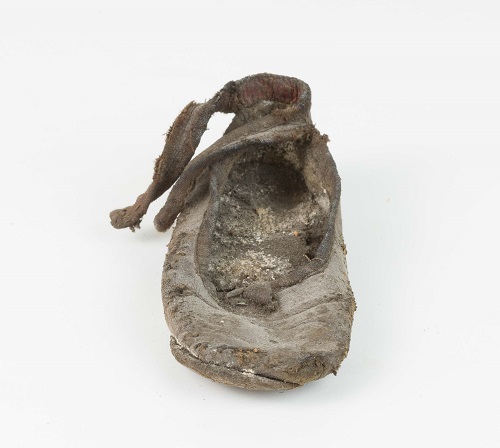 In York Castle Museum’s collections of men’s and children’s shoes, we have two examples. The first example is quite the pair. They were discovered in 1996 during the renovation of a house in Bishopthorpe (a village just outside York). They were found in the wall, and still have dabs of paint and drops of cement stuck to them. They were made in the early nineteenth century, and probably hidden in the 1850s or 60s during an earlier phase of renovation. 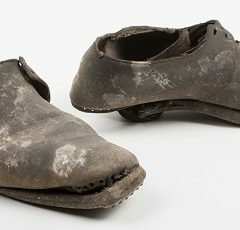 Made of thick leather, these could have been workman’s shoes, or a worn-out pair of everyday shoes belonging to a man who lived in the house. Shoes were very precious, personal objects. A basic pair of leather boots or shoes might cost a working man’s weekly wage, so people held onto their shoes, repairing them for as long as they could – and indeed the ‘Bishopthorpe shoes’ show repairs on the soles. 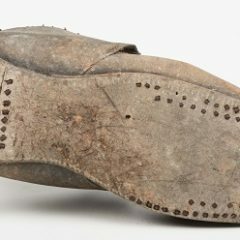 The shoes also show very heavy wear, so much so that the shape of the foot can still be seen in the leather. 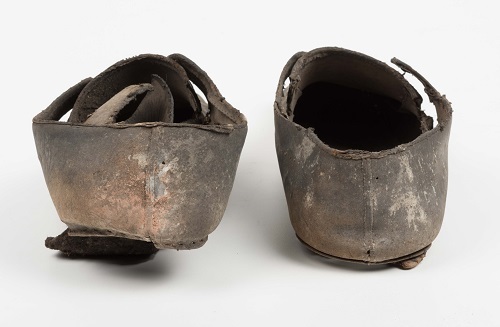 This connection – between object and owner, shoe and wearer – was considered very powerful; these aren’t just a random pair of shoes, they had a link to a particular person. Because of this, people believed they made a strong lure for evil spirits. 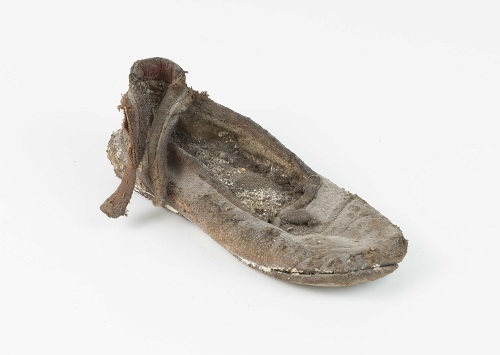 Our final concealed shoe belonged to a child. It was discovered under the floorboards of a first floor bedroom above a shop on Gillygate, York, in 2007. 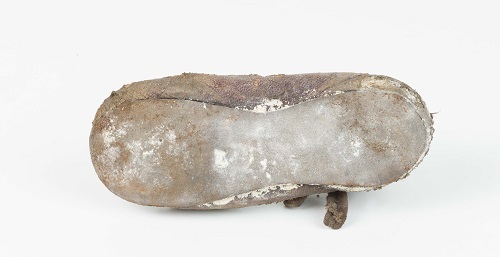 This shoe is also made of leather, and although it looks brown there are a few areas which show a reddish-purple shade, suggesting that the shoe was probably much brighter when it was new. There’s also a little piece of red cloth roughly sewn into the inside of the back, where the ankle strap might rub the child’s heel – this is a feature seen on other nineteenth-century children’s shoes in the York Castle Museum’s collection. 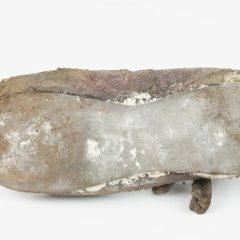 The button is missing from the strap, which hints that the shoe may have been worn and damaged before being deliberately hidden away. Unlike the Bishopthorpe shoes, the ‘Gillygate shoe’ wasn’t worn until it wore out. It’s only 13cm long, so small it could have been a toddler’s first real shoe. Items like this were thought to be especially powerful, as they were so meaningful to the people who owned and hid them. 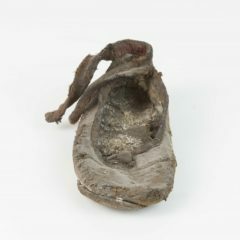 We haven’t cleaned the shoes because their condition is an important part of their history, and in the future an analysis of the dirt might tell us even more about the shoes. We don’t know who wore these, or who hid them, but we do know they are part of a much wider pattern of hiding special objects for protection and good luck. For more fascinating footwear from our historic collection, visit A Personal Collection of Vivienne Westwood Shoes. 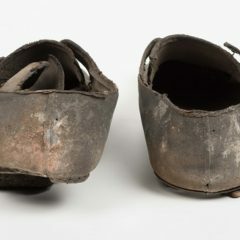 To learn more about the practice of shoes concealed in buildings, read this article about concealed shoes by June Swann.